The National Park Service is removing offensive language written in red spray paint on the Lincoln Memorial Tuesday. 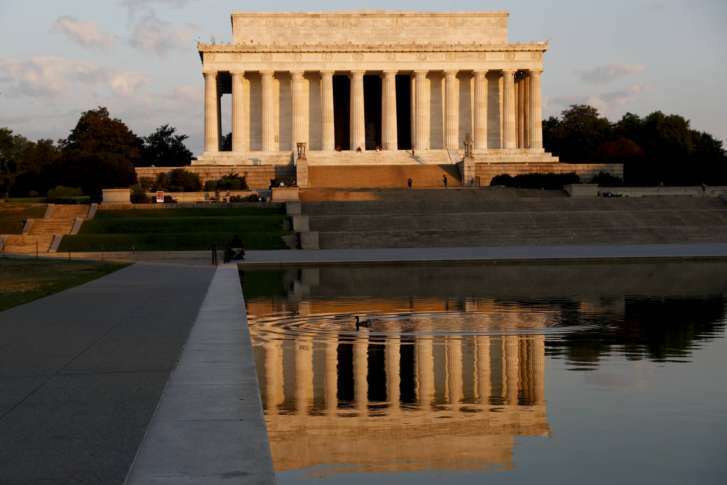 WASHINGTON — The National Park Service is removing offensive language written in red spray paint on the Lincoln Memorial Tuesday. The graffiti was discovered around 4:30 a.m. Tuesday on one of the pillars at the monument, and appears to say “[expletive] law,” the National Park Service said Tuesday. Crews are working to remove the graffiti at the Lincoln Memorial using a mild, gel-based paint stripper that is safe for use on historic stone. The National Mall and Memorial Parks monument preservation crew will apply the treatment multiple times until the graffiti is gone. The Lincoln Memorial graffiti is one of several recent cases on vandalism around D.C.
Silver spray paint was discovered Tuesday on a Smithsonian wayfinding sign in the 1400 block of Constitution Avenue. Also, someone vandalized a statue in the Dupont Circle fountain, forcing crews to shut off the fountain for days to remove the graffiti. Park Police are investigating the vandalism. Anyone with information can contact them at 202-610-7515. The park service also cleaned up vandalism on the Lincoln Memorial in 2013 when green paint was splashed on the statue.